Heavy on the veggies, light on prep, a soup that's perfect for busy weeknights. This easy Tomato Basil Riced Cauliflower skillet is a perfect dish in only 15 minutes. This easy curry features riced cauliflower, sweet potatoes, kale, and coconut milk is ready in 20minutes! These Root Vegetable Fritters are quick and easy and a perfect starter for brunch or "brinner." This quick root vegetable hash with black beans is the perfect side dish for any weeknight meal. This easy breakfast Root Vegetable Hash Frittata is loaded with your favorite veggies! Easy Pecan Dried Cranberry Cauliflower Rice is a fresh, clean and lively tasting dish. This easy one-pot meal transforms into a flavorful meal in just 40 minutes. Enjoy pizza night with this cauliflower crust comes together quickly for the perfect weeknight meal! This easy skillet recipe features farro, chicken and vegetables for a satisfying weeknight meal. Try these veggie-loaded lettuce wraps with “fried” riced cauliflower, ready in only 15 minutes! This easy weeknight soup combines Latin American flavors of onion, chiles, cumin and black beans! Enjoy a slow-cooked Italian classic in just 45 minutes! This weeknight favorite easy skillet dinner starts with chicken thighs and is loaded with vegetables. With cauliflower rice, lime, and cilantro this easy to make blend makes for a quick weeknight meal. This Cascadian Farm™ blend is the perfect starter for a black bean burrito bowl chock-full of brown rice! Purely O’s cereal, peanut butter, banana chips and raisins—this snack mix has it all for a treat! Creamy chocolate hazelnut spread meets Cinnamon Raisin Granola in this super easy and decadent toast. Enjoy your smoothie in a bowl with this creamy peach delight. This extra easy toast makes a great post-workout bite, breakfast on the go, or quick dinner. Parrfaits made with pistachios, creamy yogurt, Hearty Morning Fiber Cereal, fresh berries and honey. These raspberry crumble bars have just the right amount of granola and sneak onto your breakfast plate. Get your chocolate and peanut butter fix without the guilt! Spicy, sweet and salty all in one delicious granola and cereal snack mix perfect for snacking on the go! Loaded with satisfying ingredients like chia seeds, hazelnuts and coconut, favorite after-school snack! Try this chia pudding recipe for a simple and fresh breakfast or snack option. These no bake granola bites are the perfect on the go snack perfect for busy days, packed with protein! Packed with almonds, chia and oats, this granola makes overnight oats extra flavorful and extra easy! The classic combination of bananas and peanut butter combine in these creamy smoothie bowls. Inspired by our love for carrot cake, you’ll want this cookie on hand for a quick on-the-go breakfast. 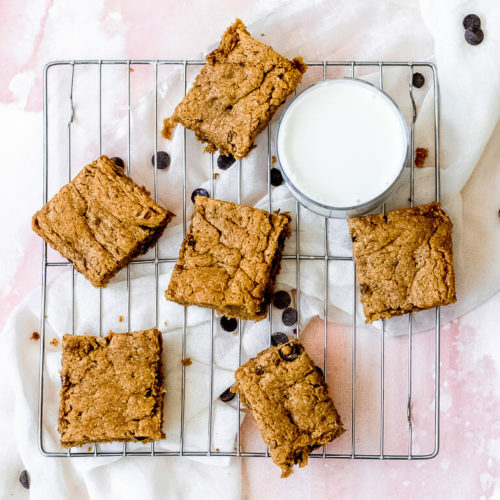 These granola almond butter blondie bars are a healthier version of classic blondies.